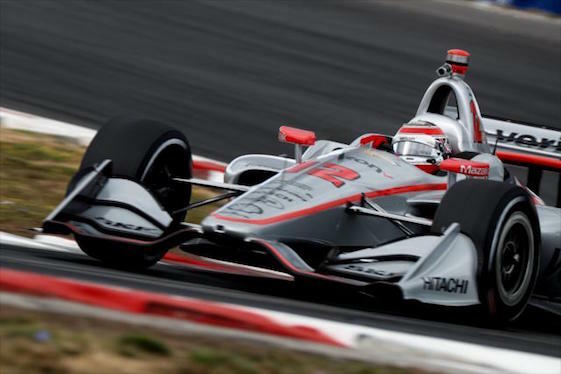 Team Penske’s Will Power laid down the fastest lap in Portland qualifying on Saturday. Having qualified seventh for his two previous starts at the facility in The Great Northwest _ in 2006 and ’07 _ Power blitzed the Verizon IndyCar Series field Saturday to raise his list of pole-winning tracks to 25. Power re-set the track record during the first round of knockout qualifying with a lap of 57.2143-seconds around the 1.964-mile/12-turn permanent road-course in Oregon, eclipsing the previous mark of 57.597-seconds set by the late Justin Wilson in 2005. Competing in the Firestone Fast Six, Power posted a lap 0.3410-seconds quicker than Team Penske teammate Josef Newgarden _ the third time in the past five qualifying sessions that Power won the pole with Newgarden second. Additionally, Power moved past open-wheel icon A.J. Foyt Jr. into second place in career Indy car poles. Power now has 54 career poles, with “Super Tex” at 53. Mario Andretti leads all drivers with 67 poles. Power was asked if his previous experience with this layout from his Champ Car World Series tenure played any part in his pole-winning performance. The 2014 series champion, Power also took another step toward winning a second title. The point for pole moved the native Australian within 67 points of four-time series champion Scott Dixon with two races remaining. Power has a prime opportunity to gain on Dixon in Sunday’s race, as the Chip Ganassi Racing star qualified 11th. “At the end of the day we have to win (races),” said Power, the reigning Indianapolis 500 champion and winner of last Saturday night’s oval-track event at Gateway Motorports Park in Madison, Ill.
Newgarden, the reigning series champion, was pleased to complete the front row sweep for car-owner Roger Penske. “I thought we would be top-five,” said Newgarden, driver of the No. 1 Team Penske Chevrolet. “I felt like we had that speed, so did Will, for sure. I didn’t know if we would have enough for the pole. I hoped so. We had been there, flirting with that top spot. It was just difficult to read the time sheets with how many yellows (flags) we’ve had, how many checkups we’ve had. I don’t think anyone posted the best time in practice. Andretti Autosport’s Alexander Rossi, who trails Dixon by 26 points, has a similar opportunity from the No. 3 starting position with Dixon several rows back. “As I’ve always said, he (Dixon) can start wherever and he’ll still finish in the front,” said Rossi, driver of the No.27 Honda. “I think at the end of the day, you have to take the good with the bad and it’s unfortunate. It’s disappointing because I don’t think our car had the pace that Will did, and he’s been kind of the car to beat all weekend and we’re struggling to find that extra little bit. Dixon’s average starting position this season in the No. 9 Honda is only 8.4, and he has failed to start higher than ninth in the past three sessions. Dixon started ninth at Mid-Ohio Sports Car Course in Lexington, Ohio, and 13th at Pocono (Pa.) Raceway. Still, he went on to finish fifth and third in those respective races. Sebastien Bourdais rallied from a crash at the end of the morning’s practice to qualify fourth. The Frenchman had just turned the session’s fastest lap when he lost control in Turn 10 and slammed into the tire barrier with the rear of the car. The crew of Dale Coyne Racing with Vasser-Sullivan repaired the chassis in less than three hours. Dale Coyne Racing’s effort this weekend includes American rookie Santino Ferrucci _a test/reserve driver for American-owned Haas F1 Team in the FIA Formula One World Championship _ as well as rookie series regular Pietro Fittipaldi. Andretti Autosport placed three drivers in the Fast Six. Ryan Hunter-Reay, the 2012 series champion and 2014 Indy 500 winner, will start from the fifth position and rookie Zach Veach from a career-best sixth. Veach reached the final qualifying round for the first time this season. This will be the first race sanctioned by INDYCAR and contested at PIR since 2007. Sunday’s broadcast will begin at 2:30 p.m. (EDT) on NBC Sports Network and the Advance Auto Parts INDYCAR Radio Network. The Mazda Road to Indy development ladder sanctioned by INDYCAR has doubleheader events scheduled for all three levels at PIR. The first race in each series took place Saturday. _ Native Mexican Patricio O’Ward capped a dominating Indy Lights presented by Cooper Tires season by winning for the ninth time in 16 races. O’Ward, a 19-year-old resident of San Antonio, Texas, held off Andretti Autosport teammate Colton Herta to secure the series title. The season concludes Sunday with a race at 12:55 p.m. (EDT). Pole-sitter O’Ward broke the record for most poles collected in a single season (nine), a mark previously shared by Bryan Herta, Colton’s father; Townsend Bell, Thiago Medeiros and Ed Jones _ all with eight poles. Andretti Autosport’s Indy Lights program posted its 48th win. Since 2005, the organization owned by Michael Andretti has earned two series titles (2008/Raphael Matos and ’09/JR Hildebrand) and two Freedom 100 wins at Indianapolis Motor Speedway (2016/Dean Stoneman and ’18/Herta). _Oliver Askew (Cape Motorsports) won the Pro Mazda Championship presented by Cooper Tires race by 1.3482-seconds over series champion Rinus VeeKay (Juncos Racing). Sunday’s race is scheduled for 5:15 p.m. (EDT). _ Kyle Kirkwood, who wrapped up the Cooper Tires USF2000 Championship a month ago for Cape Motorsports, won the 25-lap race. Rasmus Lindh actually led the first lap, but Kirkwood passed him on Lap 2 and led the rest of the way for his 11th victory of the season. A win in Sunday’s 6:20 p.m. (EDT) race would tie Kirkwood with JR Hildebrand (2006) for the series record for most wins in a season. Verizon IndyCar Series point standings: 1, Scott Dixon, Chip Ganassi Racing, 568; 2,Alexander Rossi, Andretti Autosport, 542; 3, Will Power, Team Penske, 501; 4, Josef Newgarden, Team Penske, 490; 5, Ryan Hunter-Reay, Andretti Autosport, 421; 6, Simon Pagenaud, Team Penske, 400; 7, Robert Wickens, Schmidt Peterson Motorsports, 391; 8, Graham Rahal, Rahal Letterman Lanigan Racing, 371; 9, James Hinchcliffe, Schmidt Peterson Motorsports, 353; 10, Sebastien Bourdais , Dale Coyne Racing, 334.